Parrots are amazing in everything they do and everything they can learn and some have the most stunning colors you will ever see. Smart?? it goes without saying that the skills they possess are what make them the reason they live in peoples homes. Parrots are exotic and wild by nature. They have internal clocks that let them know when the seasons change, when to start molting, when to start mating – these things will never be bred out of them contrary to what any breeder may tell you. They need specialized care that is quite different than our domesticated pets but in reality, anyone can do it – but not without education and research – if it was possible without those things, we wouldn’t have so many calls for help from people with behavior concerns. For every bird that comes into us, its a new learning experience. Each bird is an individual – and while all the African greys may be very similar in certain traits, there has never been any 2 alike in behavior. This article may be a bit longer than the normal ones I put out but is worth the read. These issues are conversations I have on a weekly basis with potential adopters/fosters. One of the most frustrating things I hear from people is how they believe a parrot needs to be ‘disciplined’. If he bites – I rap him on his beak and tell him NO very loudly! or – I will tell him NO and put him in a carrier and put that carrier in a dark closet for a time out! or – I will tell him NO -you are a BAD bird – immediately put him in his cage and cover him up! How incredibly sad that in a day of immense technology and advances in behavior training that some people will still resort to “abuse” in order to try and control their pet! The reality – you will never “control” your parrot. You can work with him and condition him with training, use positive reinforcement and ignore the bad behavior – reacting to the behavior as above is still a reward for the bird and cruel. Would you do this to a 2 year old child? No? Your parrot is exactly like a 2 year old child – for its entire life. Please stop hitting your bird – and do not punish them for a normal behavior – birds bite for a REASON – its your job to figure out why – listen to your bird, watch the body language – NO bird bites just “because”! And please don’t believe everything you are told from faceless friends or forums on the internet. Many people still believe their archaic ways are the only ways. Talk to your vet! Cages – the biggest arguments I have ever had are about cages. Strange isn’t it!! Your parrots cage should be big enough that he can turn around fully – wings outstretched – and have room for toys. The bigger the bird, the bigger the cage – don’t want a big cage?? do NOT get a big bird! Toys – are NOT just toys. Toys are needed to keep those sharp minds occupied and give them something to do. They don’t like the ones you bought? Get another one – and another one, and keep going until you find the ones they like. Many birds coming into us have never had proper toys and turned to their own feathers out of boredom and stress – we provide the toys they “like” and guess what – most stop plucking and engage those minds with things they can destroy/chew and forage with. Yes, you will go through alot of toys – they should have at least 4 – 6 toys in their cage – more depending on the size of the cage. Learn how to make them in bulk, you can be creative and save a ton of money! Perches – are a necessity and not only do they need a good variety – they need the right SIZE. Their feet should sit comfortably around the perch, if they sit flat footed – the perch is to big – an african grey foot is half the size of a macaw foot – why would a macaw perch be found in a grey cage? Cement perches – hurt – and are not made for a bird to sit on all day. Almost every bird incoming has lesions/calluses on their feet due to sitting on improper perches – some have early atrophy setting in as well. Rope perches are ideal along with tree branches (bird safe!! )and a pedi perch for nails – placed in an area where they do not sit all day long. Your grate on the bottom – why would anyone want to use bedding material of any kind? To mask the smell? What smell?????? If your bird droppings smell, you better see a vet! Your bird droppings are important and you should be looking at them every single day – if there is something wrong with your bird, you will see it in their droppings. 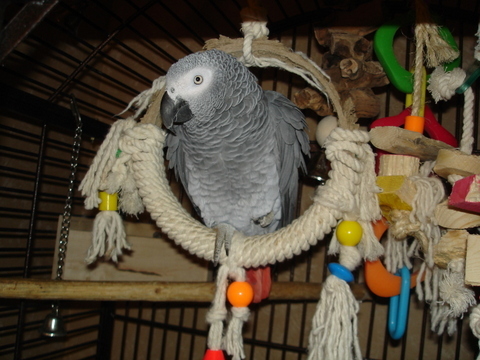 Certain bedding ie: pine shavings are toxic to parrots! Most newspaper now is made with vege dyes and not toxic – this should be changed out daily with clean paper. This allows you to monitor not only their droppings, but how much food they are or are not eating. Sudden weight loss in a bird is serious. Your bird can crash and be dead within 48 hours. Food – a healthy diet produces a healthy bird. Feed your parrot crap and you will notice it in their droppings, feather condition, feet/beak condition and behavior. Later in its life, it will show up in their bloodwork, they will have heart disease, kidney disease, liver disease – Vitamin deficiencies – the list of ailments is no different than what you can find in humans with poor diets. This leads right back to veterinary care. The majority of people I have talked to lately do not believe in vet care for their parrots. They continually tell me that the bird is healthy and has never shown any signs of disease. Interesting concept considering many parrot diseases are zoonotic – and your bird could be “carrying” the disease and shedding it but not exhibit symptoms – but you wouldn’t know that because for all intense purposes, your bird looks fine. Those zoonotic diseases can also pass from bird to human – scary thought! Birds from petstores and breeders are the worst carriers of disease – followed by hoarders/collectors. Every bird should have a checkup with an Avian vet yearly – or every other year at the minimum. Your vet is a wealth of information and if they don’t have the answers you need, most will search them out (alot of DVMs have limited exotic experience). This falls into the “are you serious” category??? Some talk, some don’t. Some talk and then endure trauma, and stop. There is NO guarantee your African grey will talk – we have had many who did not utter a sound – and others who don’t know how to stop. Smart? most are very smart – but humans tend to limit them in what we do not provide for them. If you google you-tube videos you will be amazed at some of the exotic birds abilities!! Like everyone? hahahaha that is an exception and NOT the rule. You can bring home a bird that loves you and only you – the following year that bird is now sexually mature and has decided your husband or child is their new “best friend” and they dont’ like you or vice versa – your spouses bird all of a sudden loves you more than you love them. Or, your bird will simply hate everyone else as they perceive them as a threat to you – their chosen “love”. You have to deal with it simply put and ensure the bird is not out and attacking anyone if they come to visit. The bird sees nothing wrong in protecting the love of their life. Biting – every bird will bite at some point in their life – or yours – and they will have a perfectly good reason for doing so – its the best way they know how to communicate – its our job to figure out what they are telling us. Over stimulated/excited – can bite. Every human feeling we experience, birds also experience but handle in a different way. Your new hairstyle or color is a good reason to bite. New jewelry, colored nails, sparkly hand lotion – all perfectly good reasons to bite. New pet, new child, new furniture, yup – more reasons to bite. So, with all this information, are you still reading and wanting to adopt a parrot? If you answered YES – that’s GREAT!! It means you are willing to learn and educate yourself before bringing one into your home. They can provide immense joy to families and wedge their way into your heart incredibly fast. Provided with the proper husbandry/medical and enrichment, they will be one of the most amazing animals you can share your life with. Continue to research and look at the species – you may have always wanted a big macaw, but is your lifestyle suited to the huge demands of this large parrot? You love cockatoos – the most silly/goofy and obnoxious species – but also the most unpredictable and loud!! You live in a shared dwelling – will your neighbors be as happy to hear your cockatoo greet you every day as you are? Probably not. You want a family one day, what happens when your best friend hates your spouse? You learn to keep them separated! They are a huge responsibility with a huge lifespan, 50 – 100 years – think of the long term when you make the decision to bring one into your home. January 29, 2012 Anna Comments Off on Why a parrot? 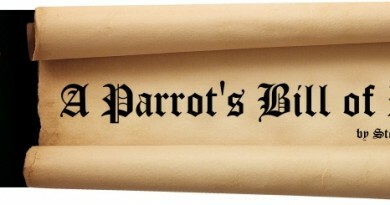 Yes, to all of this article…Most humans have no concept to owning a parrot. They truly can act out, a spoiled 2 year old child is easier to manage. Parrots seriously require more attention. They do not go down for naps!! !